Our real estate market is not taking any kind of a holiday break! 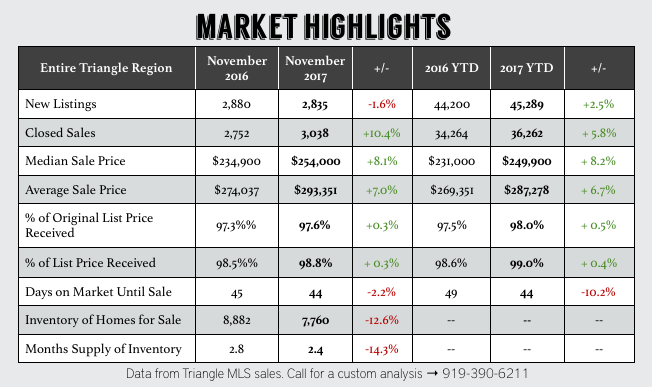 The Triangle Area housing market is not showing any signs of slowing, and November closed out with more of the same strong numbers we’ve been seeing this year. ➤ Buyers are still out in force. Serious buyers haven’t gone anywhere for the holidays; they’re too busy looking for their next house! Since there are fewer houses for sale this time of year, buyers are very serious and are fiercely competing over inventory. For most of the market, when a property is correctly priced and marketed, it can generate multiple offers. As price points climb, competition tends to decrease, but the market remains strong. ➤ My clients continue to get multiple offers when listing their home for sale. November was a very busy month with lots of activity. One of my clients just came to me wanting to sell her condo by the end of the year. Normally, that would be a tight deadline. We capitalized on the Triangle Area’s intense demand, and combined that with Greener Grass Real Estate’s strategic marketing plan. In just ONE week, we closed the sale with multiple offers. ➤ Expect greater inventory of homes in the near future. Immediately following the holiday season, there will likely be an influx of homes for sale in January. This will give buyers more choices, bringing more interested buyers to market, and will continue the strong real estate market growth we’ve seen recently.